February 4 , 2009 -- Assistant Professor of Geosciences Mary Leech has received a prestigious CAREER grant from the National Science Foundation. The Faculty Early Career Development grant, the Foundation's most prestigious award for faculty at the beginning of their careers, recognizes excellence in teaching and the integration of research and education. SF State Assistant Professor of Geosciences Mary Leech with the Sensitive High Resolution Ion Microprobe (U-Pb SHRIMP) used in her research. This CAREER award was the ninth made to a San Francisco State faculty member and the seventh within the past five years. The grant of $507,264 will support Leech's continuing lab and field research on formation of the Himalayas in India and Tibet. Leech's earlier study of rocks from the collision zone between India and Asia showed that the two, which were once separate continents, collided seven million years earlier than previously believed. An educational component of the grant will focus on the development of a new geology curriculum for third through sixth grades in the San Francisco Unified School District. SF State undergraduate and graduate students will be involved in the lab and field research in the Himalayas as well as the public school classrooms. "This is terrific recognition of the caliber of Dr. Leech's challenging research and excellence in teaching," said Dean of the College of Science and Engineering Sheldon Axler. "It also speaks well of the kinds of opportunities we can give our students here at San Francisco State University and of the quality of our faculty." "This funding will contribute to a greater understanding of the large scale hypotheses regarding mountain formation," Leech said. "One of the areas we will explore might tell us if the erosion that occurs at the top of the Himalayas due to monsoonal rains has a role in the continued building of these mountains." Leech will test models of the geodynamics of the Himalayas by examining granite samples from Ladakh in northern India and southern Tibet. 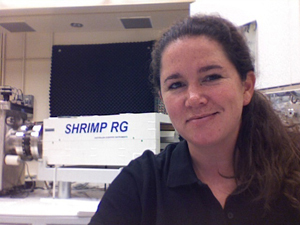 The age of the granite will be determined through analysis of its minerals using the Stanford University-U.S. Geological Survey Sensitive High Resolution Ion Microprobe (U-Pb SHRIMP) and the isotopic measurements at the Keck Isotope Laboratory at University of California Santa Cruz. Leech hopes that these analyses will determine the source of the granite beneath the Tibetan plateau and confirm or deny a link between climatic and tectonic processes. Leech is the recipient of several national honors for excellence in science including a National Science Foundation research fellowship. Prior to earning a doctorate in geological and environmental sciences from Stanford University in 1999, she was awarded a National Science Foundation Minority Graduate Fellowship. Leech, whose maternal heritage extends to the Cherokee Nation in northeastern Oklahoma, is a San Francisco Bay Area native and resident of Woodside. In addition to Leech, SF State faculty who have received the NSF Career grant are: Assistant Professor of Biology Diana Chu (2008); Associate Professor of Chemistry and Biochemistry Teaster Baird; Associate Professor of Chemistry and Biochemistry Andrew Ichimura and Associate Professor of Computer Science Rahul Singh (2007); Assistant Professor of Computer Science Edward Lank (2005); Assistant Professor of Mathematics Eric Hsu (2004); Professor of Biology Zheng-Hui He (2000); and Professor of Biology Leticia Marquez-Magana (1996).